Helena Jans, the protagonist of my novel The Words in my Hand* worked as a maid in seventeenth century Amsterdam. She could write – we know this because Descartes wrote to her, and anticipated her letters to him. The letters are lost. Helena was literate, and that was highly unusual for a woman of her social standing at the time. Dutch girls were educated until the age of twelve, but only the wealthiest were taught to write. The written word belonged to men. 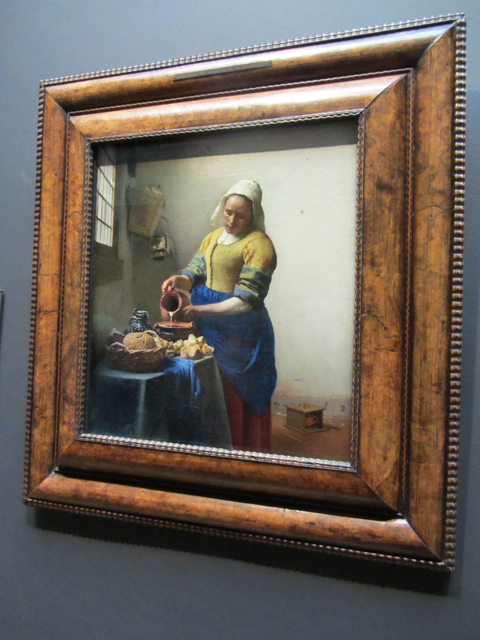 When we look at Vermeer’s A Lady Writing a Letter, or A Lady writing a Letter with her Maid, we are witnessing something unusual, something, to some extent, transgressive. Vermeer’s maids pour milk, they stand back, they do not write. It intrigued me. How did Helena learn to write? The archive had no answers. The simple, difficult act of writing – and all that entailed – Helena’s struggle for literacy – became a central theme in the novel. I’ve followed the #readwomen2014 initiative with interest – both as a reader, and as a writer. I’ve also followed the depressing stats from VIDA for several years. In the novel, Helena learns that proper writing, writing with a quill, is what men do. And then, when she begins to create work of her own, that no man reads a book written by a woman. Helena lived nearly four hundred years ago. Writing her story, made me aware not only of what was, but what is – what it is as a woman to write. All is not equal. Not then. Not now. The Milkmaid, Johannes Vermeer, 1658. * the novel tells the story of the hidden relationship between Dutch maid, Helena Jans van der Strom, and French philosopher, René Descartes.